A walk along the northern trails of Point Lobos State Reserve is always a nice treat. This park tends to fill up to capacity frequently, but most of the traffic (both car and foot) stays toward the main trails in the southern side of the peninsula. 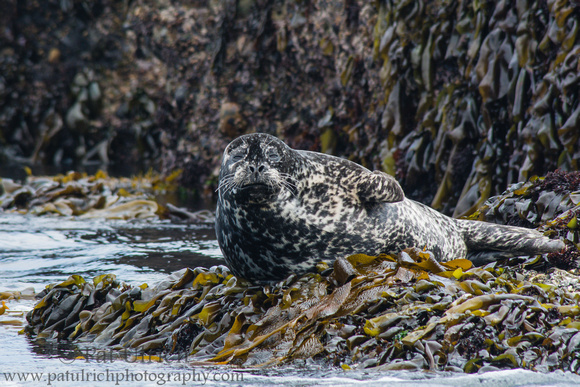 On this summer trip, we enjoyed a nice view of a herd of harbor seals resting on the rocks just offshore in Moss Cove. Their colors ranged from sun-bleached gray to this particularly handsome darker black. The kelp covered rock was an interesting setting for a photograph, but even in the short time we were watching them, the tide was visibly rising and its lush green island was soon to disappear. 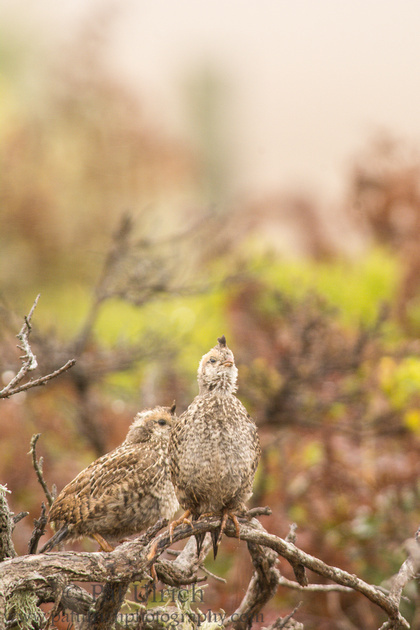 California quail are one of my favorite species to photograph, and it was a treat to get to see some fledglings on my last summer trip to Point Reyes National Seashore. On several previous occasions, I had seen younger adorable downy fluff balls scurrying around behind their parents, and this was the first time I had some really nice looks at slightly older fledglings. 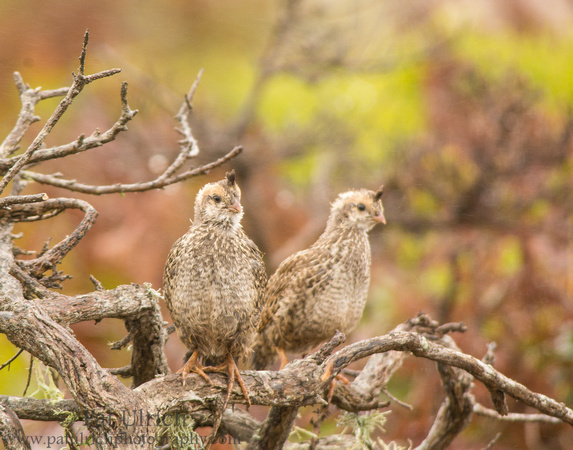 The Abbotts Lagoon area is a hotspot for finding quail in Point Reyes. In fact, I often didn't even need to get out of parking lot, or even the car, to find some in front of my lens. Since they can be rather skittish, it actually works quite well to use the car as a mobile blind to get close as they stand on the fence railings and bounce around the coyote brush along the parking lot. That's what I was doing on this rather dreary morning in the park. There was a small covey hanging out along the fenceline, so I drove up slowly, rolled the windows down, and parked the car in a nice position to observe them out the passenger side window. As I was watching the group, I heard the distinct call of "Chi-Ca-Go" from behind my vehicle on the driver's side. 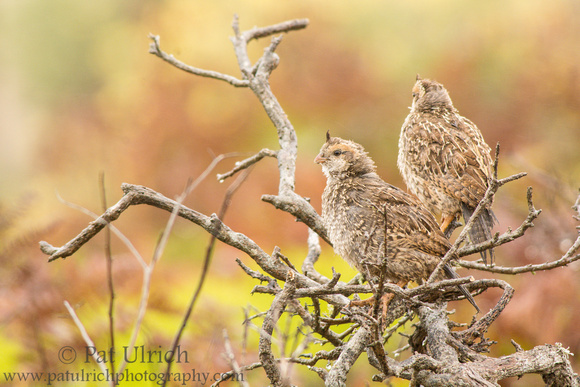 Though notably, it was a rather small rendition of a quail song, and when I turned around in my seat, I saw this pair of fledglings on the branches. 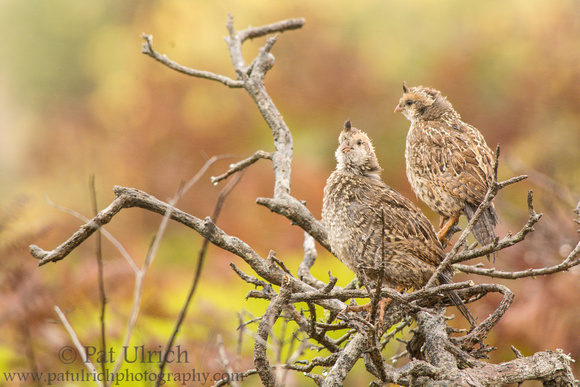 I had long been chasing a photograph of California quail in song, which I finally managed to capture on a 2014 trip -- but I had never imagined the opportunity to capture young birds doing the same. Unfortunately, to have a chance, I needed to contort my body to point my lens out of the opposite rear window to get the right angle before the moment had passed. I strained my body to get into a reasonable stable position and waited for another chance. California quail can put on such a show when they are calling out -- throwing their heads back with abandon -- but that means the beak and eyes are moving quickly. On this morning, it was just too quick for my lens under the deep overcast light, and the frame above is the closest I came with any bit of sharpness to the singing head. I had only a few chances to capture the song before this young pair scuttled back down into the brush, and I'm disappointed to have failed to capture a clean shot. That said, these unexpected moments are what is so fun about wildlife photography, and even without something to add to my portfolio, it's an encounter I won't soon forget.